But those milestones, however unpleasant, tell us more about the Pittsburgh’s past than its present. The Kansas City Chiefs victory a Heinz Field exposed several fundamental weaknesses of the 2018 Steelers, weaknesses which Mike Tomlin will be hard pressed to paper over. The simple take away from the Steelers 21-21 against the Browns was that without 6 turnovers from the Steelers, Pittsburgh wins fairly easily. While far from flawless, that analysis is largely accurate. The simple take away following the loss to the Chiefs is to point to the offense’s 37 points and lay the blame on the shoulders of Steelers defense. That would be a mistake, however. The Steelers first two drives netted negative yardage, as a hurried Ben Roethlisberger’s passes flew high and off target. By the time the Steelers offense got out of the red, the Kansas City Chiefs had already scored two touchdowns, and the only answer the Steelers offense could muster was a missed Chris Boswell field goal. Credit Randy Fichtner and the Steelers offense for not panicking and keeping sharp enough focus to come back and tie the score at 21-21. With feeding the ball to James Conner a non-option given the score, and with Ben Roethlisberger unable to make anything more than piecemeal connections with Antonio Brown, Ryan Switzer Jesse James and JuJu Smith-Schuster stepped up. But as it did during the 4th quarter against Cleveland, the Steelers offense sputtered during the 4th quarter. 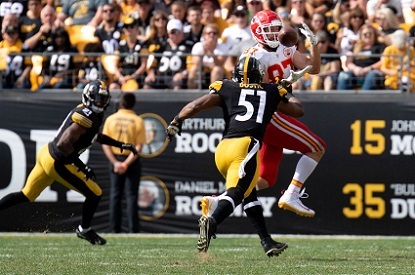 By this point in the game it had become painfully clear that Pittsburgh’s defense could do nothing to stop Patrick Mahomes and the Kansas City Chiefs offense. While Art Rooney II’s words may hold some truth, if you’re MO for winning games is to score 50 points a game, then your offense cannot take a quarter to warm up, nor can it sputter in critical moments late in the game. Of course the Steelers goal never was to simply make every game a shootout and count on the offense to prevail. During the 2018 off season the Steelers went through a whole sale house cleaning of their secondary and made moves to bolster its linebacking corps. Last week, against a re-tread quarterback in Cleveland, the Steelers defense had a reasonably strong showing for itself. Against an emerging elite quarterback like Patrick Mahomes, the Steelers defense came out flat footed. One of the key new pieces the Steelers added in the off season was Jon Bostic. The scouting report on Jon Bostic was that he was fairly strong against the run, but struggled in coverage. And against the Chiefs, Bostic defended the run well enough, but looked clueless in coverage as Travis Kelce burned the Steelers down the middle all afternoon long. The Steelers doubtlessly missed Joe Haden, but on one in the rest of the secondary did anything to suggest things would be different had Haden played. Artie Burns thus far failed to translate any of his summer magic from St. Vincents to the regular season. Terrell Edmunds missed a key tackle and looked out of place early and often. Morgan Burnett and Cam Sutton were forgettable in first starts for the Steelers. The same can be said for the Steelers front seven. Cam Heyward did force a key incompletion and later a fumble. So did T.J. Watt, but that was his sole highlight of the day. The answer to an ailing secondary is to pressure the passer, and the Steelers front seven barely touched Patrick Mahomes. Furious fans took to social media to draw comparisons to the Jacksonville playoff debacle. That’s understandable, but perhaps the 2002 season opener against the Patriots provides a more accurate comparison. Following the same script that Tom Brady and Bill Belichick used 16 years ago, Andy Reid and Patrick Maholmes essentially abandoned the run in the second half. And once again, the Steelers were powerless to stop them. That 2002 Steelers team started 1-3, yet clawed its way to a division championship. Only a bogus roughing the kicker call kept Pittsburgh from an AFC Championship appearance. But that rebound required Bill Cowher to spark the team with a quarterback change, and the Steelers pass defense remained a liability all season long. Mike Tomlin will not and should not bench Ben Roethlisberger. Otherwise, the Steelers will continue to fall hard this autumn. This entry was posted in Steelers 2018 Season and tagged Antonio Brown, Art Rooney II, Artie Burns, Ben Roethlisberger, Cameron Heyward, Cameron Sutton, Chris Boswell, James Conner, Jesse James, Joe Haden, Jon Bostic, JuJu Smith-Schuster, Morgan Burnett, Pittsburgh Steelers, Randy Fichtner, Ryan Switzer, Steelers secondary, Steelers vs. Chiefs, T.J. Watt. Bookmark the permalink. With these new tackling rules, if Jack Lambert were playing today he wouldn’t be in the Hall of Fame, he would be in jail.